Oh what a saucy enchilada you are! 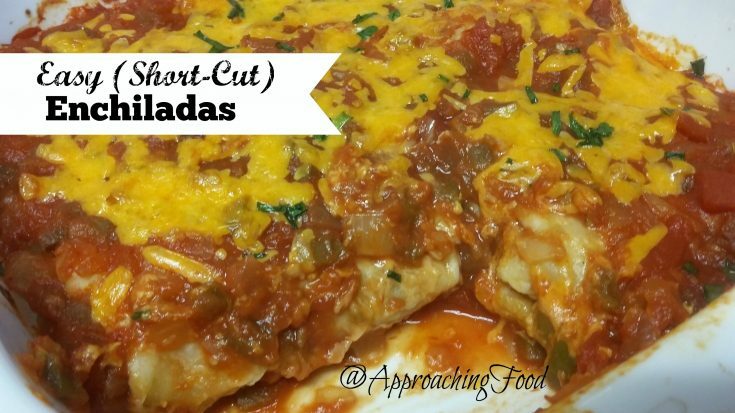 One of my favourite throw-it-together meals is Easy Enchiladas. I make these when I want a hot, satisfying dinner, but with little work. I prep the filling in advance and freeze it, precisely so that I can throw this dish together when I need a hearty family meal that will take me 5 minutes to make (and 15 to bake). That’s right, this dish can be on your dinner table in 20 minutes from start to finish! These enchiladas are stuffed with seasoned rice and beans as well as cheese, making these vegetarian. You could easily add some meat if you wanted, but there’s certainly enough protein without it. And when you bite into it, it oozes cheese and seasoned filling, with a nice tang from the…secret sauce. The secret shortcut step that makes the whole dish so easy? Salsa. That’s right! A jar of salsa, a bunch of tortillas, some seasoned rice and beans, plus some cheese, and dinner is ON! Now, given that this purports to be a preservative-free recipe site, how can I be ok using canned salsa? Well…progress, not perfection, right? If you have time to make your own salsa, perfect! If not, don’t beat yourself up; a homemade dish is still healthier than a frozen, preservative-filled cardboard dinner. So give yourself a break if you need it, use a can of salsa, and get dinner on your plate 20 minutes after starting! So, want to make some yourself? Let’s! This easy, cheesy, and hearty dinner pulls together in 20 minutes, and is super-tasty. Win-win-win! Pour 1/2 c. of the salsa in the bottom of a 9×9 pan, and spread out evenly. Take a tortilla and put 1/8 of the rice and beans mixture in the centre, and then top with a little cheese. Wrap it up like a burrito (fold the left and right sides in, then the top and bottom sides), and place seam side down in the pan. Do the same with the other tortillas until the pan is full. Pour the rest of the salsa on top, and sprinkle the cheese and green onions on top of that. Bake in a 375 degree oven for 15 minutes, or until the cheese on top has melted and is bubbly. Then dive in, and enjoy! Plated and ready for nom-nom-nom-ing! Mix rice, beans, water, taco seasoning, and bouillon. Boil as per usual when making rice, until water is gone (10-14 minutes), stirring occasionally. Will make about 2 cups. I usually freeze this in one cup portions, so that I can pull the mixture out to make my Easy Enchiladas whenever I want. I like to use my own homemade tortillas using this recipe, because I’m on an anti-preservative kick, but if you want to do store-bought, you do you, boo! Time is a precious commodity. And the same goes for the taco seasoning! If you can make your own (and it’s SO EASY), then great, because fewer preservatives, but again, you do what you can and leave the rest. Progress, not perfection! I love serving these Easy Enchiladas with a fresh and crisp green salad, followed by something deliciously creamy, like my No Churn Rum Raisin Ice Cream! Mm, mm, mmm! Now that’s a yummy dinner! Next Post: No Guilt Strawberry Frozen Yoghurt, because it’s summer and I like ice cream but not gaining weight. This entry was posted in Vegetarian Main Dishes on August 6, 2017 by Margaret. Have you ever tried doubling this recipe then making up a second as a casserole and freezing it in a dish ready to go in the oven? Would the tortillas be soggy I wonder? I am going to do this recipe..this week! And I think I will try making my own tortillas…maybe? It seems to be hard. In regards to making tortillas, I really do like making them! But I’ve learned that the dough needs to rest at least an hour, so that the gluten relaxes and the dough is easier to work with. I’ve tried using a tortilla press and it was useless, as the dough is too elastic, so I just stuck with a rolling pin and some elbow grease. It would definitely be easier to buy them! I just like knowing exactly what went into my food, and flour, oil/butter/coconut oil (I’ve tried all the variations), salt, and water are nice and pure! As a follow up, I have frozen tortillas full of chicken, rice and pinto beans rolled up and placed in a casserole dish. I greased the dish and poured tomato sauce in the bottom to keep it from sticking. I reheated it slowly so it could defrost without burning. It worked fine and was a very easy dinner. Sounds delicious, Jeannie! 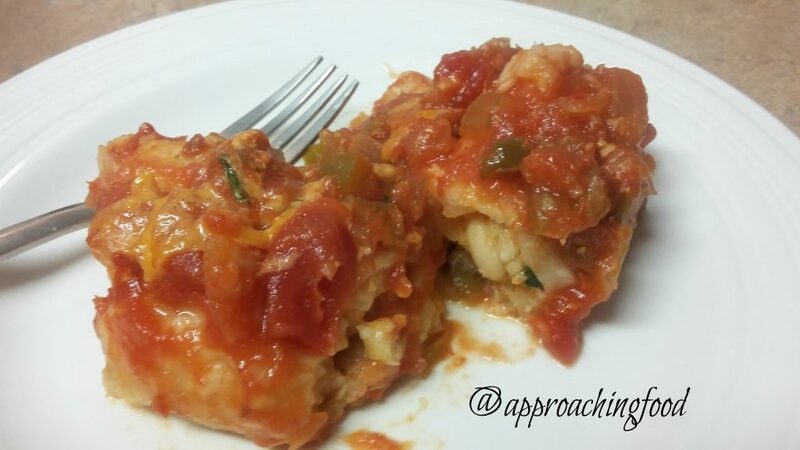 Reheating slowly, and sauce on the bottom to keep from burning — great tips! Your Enchiladas look fantastic! Hope you are having a great weekend and thanks so much for sharing with us at Full Plate Thursday. Thanks, Miz Helen! Hope you’re having a great weekend too!